Last month we took at the narrow gauge Jupiter and Lake Worth Railway aka the Celestial Railroad. This month we will look at modeling the line. The prototype itself is small lends itself very well to a small, operations based layout. There is very little information on the prototype except that it was about seven miles long, had a dock at Jupiter and did not have any means for turning a locomotive or train. Equipment on the line was sparse and consisted of two locomotives, one to two combines and a couple freight cars (most likely flat cars). Only one locomotive was used at any time. 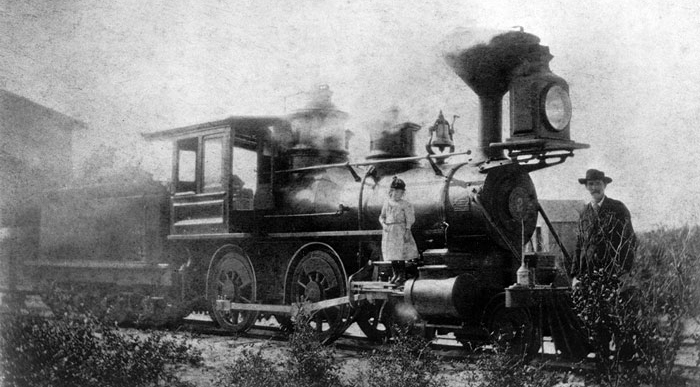 The other locomotive was kept as a backup for the first. Locations along the line include the dock at Jupiter, the stations of Mars and Venus, and a station at the end of the line at Lake Worth. The line could easily be modeled on a shelf of almost any length. I have created plans for a 24 x 60 inch layout. The prototype was 3 foot gauge, but for this version I choose HOn30 (or OO9) to take advantage of low cost N scale mechanisms and PECO track. One conversion is available from Shapeways (description at http://www.shapeways.com/forum/index.php?t=msg&th=19678&s=0). This will create an acceptable stand-in for the prototype. You could easily use the commercially available HOn3 equipment, but an affordable 4-4-0 may be hard to acquire. I believe this to be the J&LW #1 at Jupiter. Note the structure behind the tender, which could be an engine house. The railway was very simple when it started and ran the trains locomotive first when going south and backwards when going back north. A wye was added later but we will model the early operating scheme to keep things simple. From a couple photos we can deduce a few additional assumptions about the line. Jupiter must have been the home base. 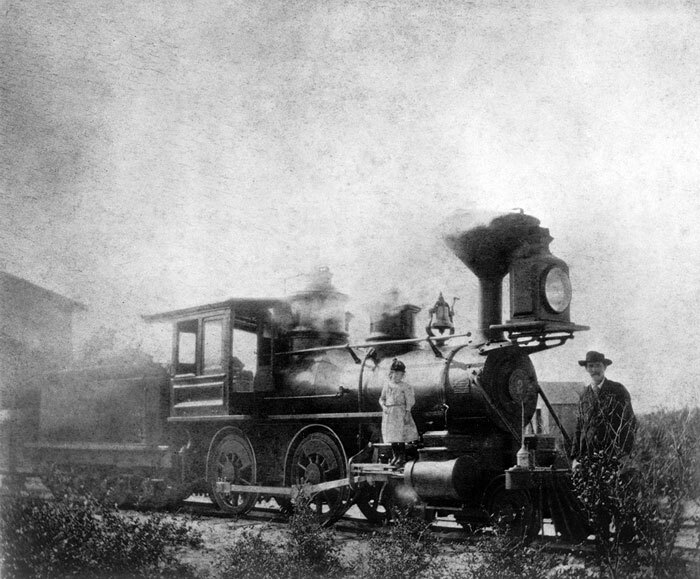 The photo of Locomotive #1 with the children was most likely taken in Jupiter as they were the children of the store manager on the pier at Jupiter. We can also see in the photo that the locomotive sits on the middle of three tracks. It appears to be a small yard or passing siding. With only two locomotives and four to five cars at most three tracks would have been sufficient. The dock in Jupiter and the yard will be the primary focus of the layout. In the plan, I included a passing siding and a storage track. The spare locomotive would be placed on the storage track while extra cars not currently used would occupy the siding. 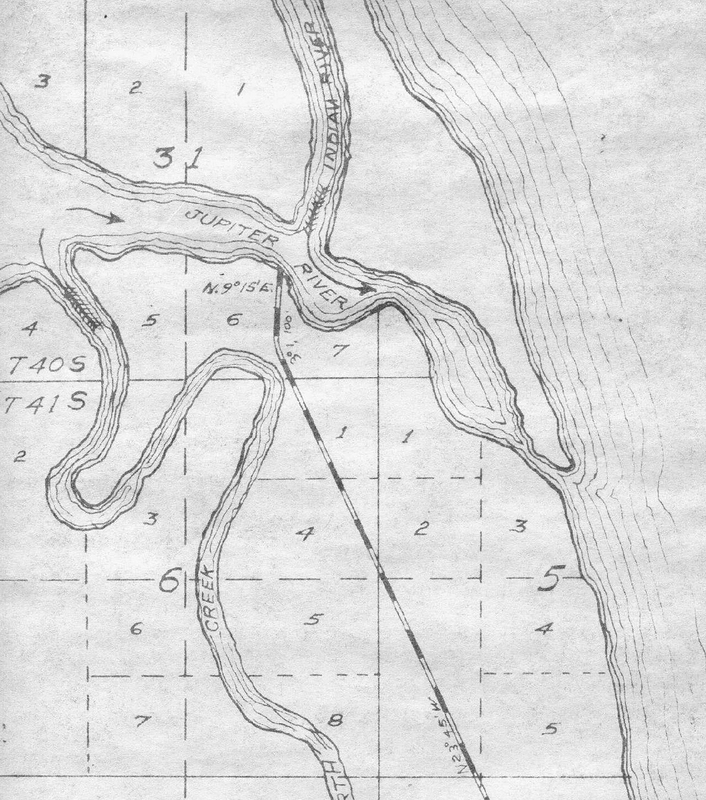 Platt of the Jupiter area showing the railroad. In order to make the individual scenes in such a small footprint, I made the track plan bend back on itself and create two halves separated by a scene divider. The 24 inch width would allow up to a 20 inch but I went with a smaller radius. Equipment should be short to fit the sidings and the curves. The layout could easily be unfolded and made to fit a long narrow shelf of 12 x 120 inches. The plan can be setup for automated back and forth between the stops for a show setting. View from the lighthouse at Jupiter Inlet. The Jupiter dock and a ship docked can be seen across the bay. Documentation about the railroad’s equipment is not clear. 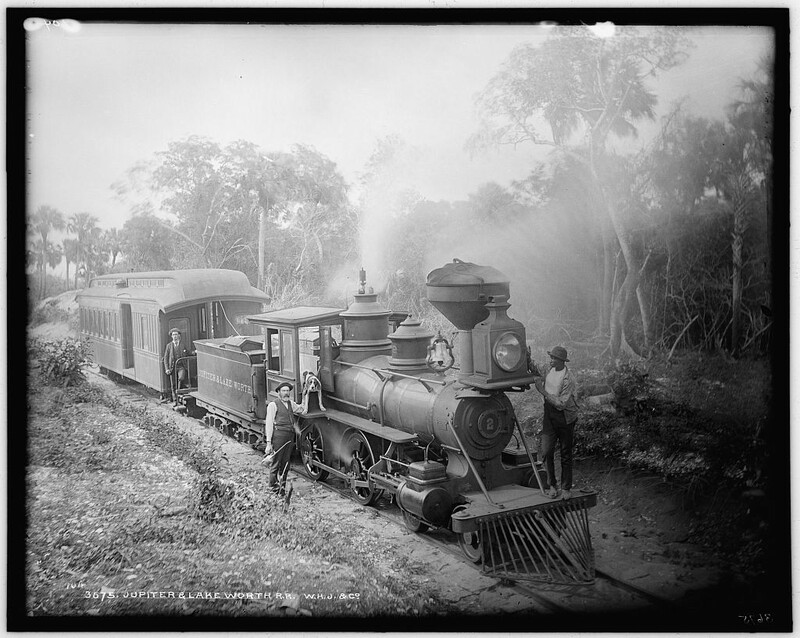 From the photographic record we know there were two small 4-4-0 locomotives and at least one combine. Some records claim the line had two combination passenger/freight cars and another one claims two passenger cars and three freight cars. For this version, we will allow room for one combination car and two flat cars. We know the line took ten years to build and as with most railroads the first car you need for hauling rails and ties is at least one flat car. 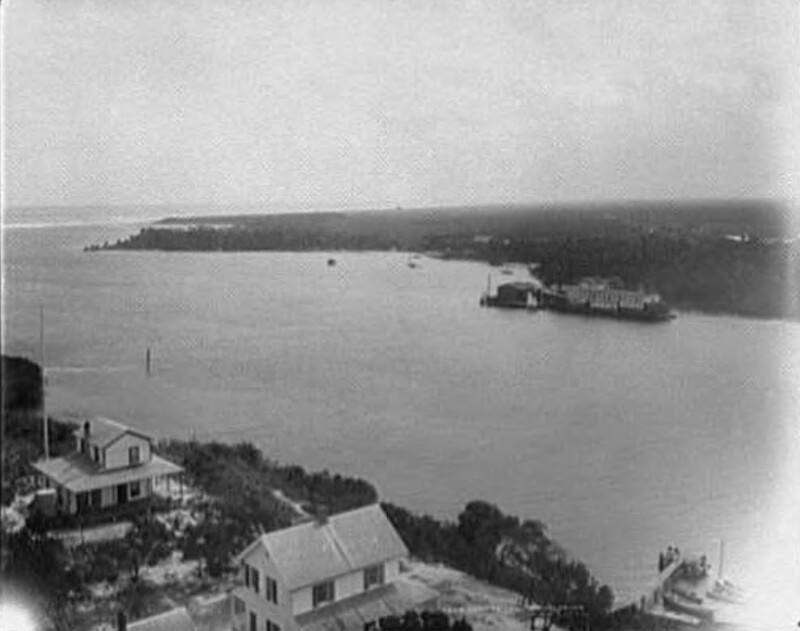 The line was also known to have hauled supplies to build at least one of the large hotels on Lake Worth. We can see from the photos of the combination car, it did not have the capacity for such work. Jupiter and Lake Worth #2. This is the only image showing any rolling stock. The single combine is rather short. With the warm climate of south Florida, it is most likely any railroad buildings like car sheds or engine house would have been more of an open-air type of structure. There is just a glimpse of what appears to be an engine house in the background of the photo of locomotive #1. 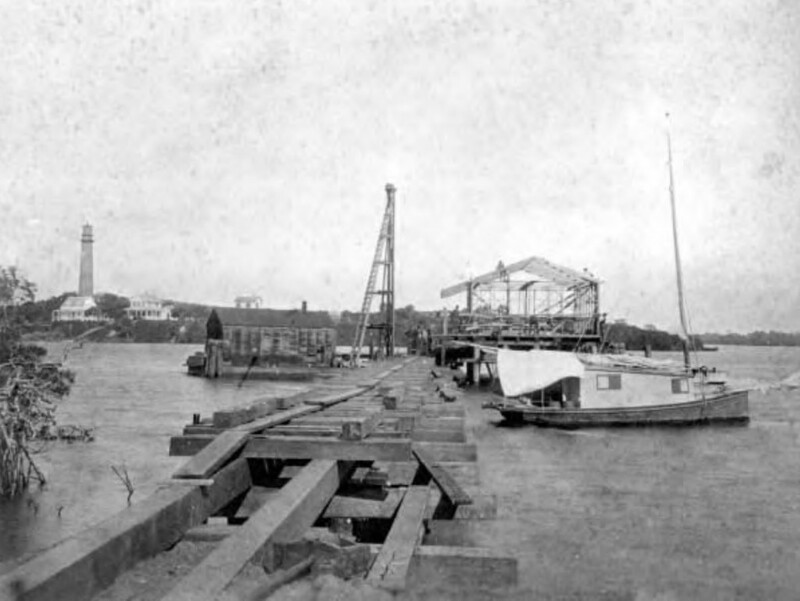 Today there is no evidence of any structures and to date I have not found any photographs of any railroad specific structures other than the dock in Jupiter. I just found this article that you posted and was thrilled to stumble across! Kudos to you! I live and work in the Jupiter- Hobe Sound community and I am a 5th generation Floridian. I would like to purchase a display Model of the Celestial Railroad and cars. I will not be running the assembly. Can you assist me with my quest, or direct me to a collector, or builder that can? I do not know of any exact model of the 4-4-0 and the combine in the pictures but there are many options. The question(s) would be, how much do you wish to spend, time to get the model and what scale? There are a number of model builders out there who can create an exact replica at any scale or bash together a fairly good representation of something pre-existing. I am not that person but depending on the price you are willing to pay, you can get what you desire. I located two 4-4-0 Baldwin locomotives with wood tenders and I had Dan Frolich, model builder in the Palm Beach area who modified the gauge and recreated the photo with the combine and flat cars. It is non operational, but looks fabulous. I can send photos if you wish.